The 57,221 square foot Hattiesburg (Miss.) Clinic Musculoskeletal Center (top) and the 56,220 square foot PAM Rehabilitation Hospital of Centennial Hills in Las Vegas (bottom) are 2018 HREI Insights Awards™ Finalists. Please click on the images to link to high-resolution versions. HATTIESBURG, Miss., LAS VEGAS and PALM BEACH GARDENS, Fla., Oct. 31, 2018 – Two healthcare facilities developed by Sina Companies have been named as Finalists in Healthcare Real Estate Insights™ magazine’s annual national awards program. Sina Companies, a nationally recognized developer of medical real estate that is headquartered in Palm Beach Gardens, Fla., developed the separate projects in Hattiesburg, Miss., and Las Vegas. The projects are the Hattiesburg Clinic Musculoskeletal Center and the PAM (Post Acute Medical) Rehabilitation Hospital of Centennial Hills. Malcolm Sina, Executive Chairman of Sina Companies, says having these two medical facilities named as Finalists in two very different categories demonstrates the firm’s flexibility and broad range of capabilities, as well as the company’s constant goal of putting patient needs, client focus and strong relationships first. The HREI Insights Awards are the first and only national awards dedicated to recognizing excellence in the areas of healthcare real estate (HRE) development and executive leadership. The awards are presented by Healthcare Real Estate Insights magazine, the first and only national magazine entirely devoted to covering HRE development, financing and investment. Hattiesburg Clinic Musculoskeletal Center, Hattiesburg, Miss. The first floor plan for the Musculoskeletal Center at the Hattiesburg Clinic. Please click on the image to link to a high-resolution version. 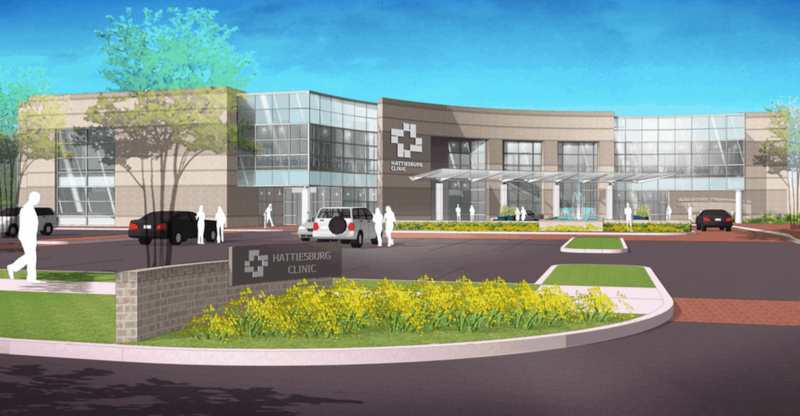 A Finalist in the “Best New Development, MOBs and Other Outpatient Facilities, 50,000 to 99,999 square feet” Category, the Hattiesburg Clinic Musculoskeletal Center is a two-story, 57,221 square foot orthopedic and sports performance center located in Hattiesburg, Miss. Sina’s client, Hattiesburg Clinic, sought to relocate their growing orthopedic practice from their main facility to an independent orthopedic facility closer to the regional orthopedic hospital. An additional challenge was to combine a large, fourteen-provider clinical practice with a 10,000 square foot physical therapy center and a 14,000 square foot indoor sports performance center featuring football, basketball, soccer and other human performance activities. The client was concerned with the affordability of the sports performance component, and for competitive differentiation the providers also had a strong desire to have this comprehensive service in-house and adjacent to the facility. Sina took the lead on programming and planning, engaging a specialty consultant who works solely in sports and fitness facility business planning to perform a lengthy sports and fitness business model. 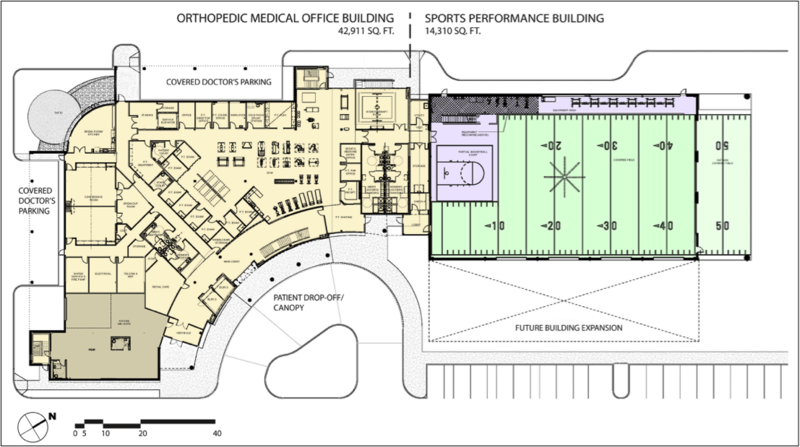 As a result, the sports facility is connected to the orthopedic project via the physical therapy suite and locker areas, completely concurrent with the primary orthopedic Medical Office Building (MOB). Construction began June 2018 on the new facility that will not only meet the needs of the client, but also the community as a whole, and is expected to open June 2019. PAM (Post Acute Medical) Rehabilitation Hospital of Centennial Hills, Las Vegas, Nev.
A Finalist in the “Post-Acute and Senior Living Facilities – Best New Ground-Up Development” Category, PAM Rehabilitation Hospital of Centennial Hills is a two-story, 56,220 square foot Inpatient Rehabilitation Hospital in a growing, family-friendly area of Northwest Las Vegas known as Centennial Hills. The client, Post Acute Medical, was able to utilize a 24-acre medical/professional campus owned by Sina Companies to fulfill their mutual goal of filling the need in the market for inpatient rehabilitation services, as none were in the vicinity of the nearby acute care hospital. In addition, the original master planned campus was able to accommodate 300,000 square feet of medical/professional tenants, but the original site plan couldn’t accommodate the requirements for an inpatient rehabilitation hospital. In order to begin the process, Sina worked with the City of Las Vegas and their local campus architect, DLR Group, to draw up a revised plan that included the inpatient rehabilitation hospital. Sina and DLR amended the master plan to design a facility that met the needs/desires of PAM, while maintaining the professional and collaborative feel of the rest of the campus. The solution called for eliminating the originally proposed three-story building on campus, building up the back of the campus and constructing a two-story, inpatient rehab hospital to be surrounded by single story buildings. This plan maintained great visibility for the hospital itself, and more importantly, preserved the views from the facility of the famous Las Vegas Strip in one direction and the scenic mountains surrounding the city in the other, providing patients, visitors and staff with a more pleasurable experience. 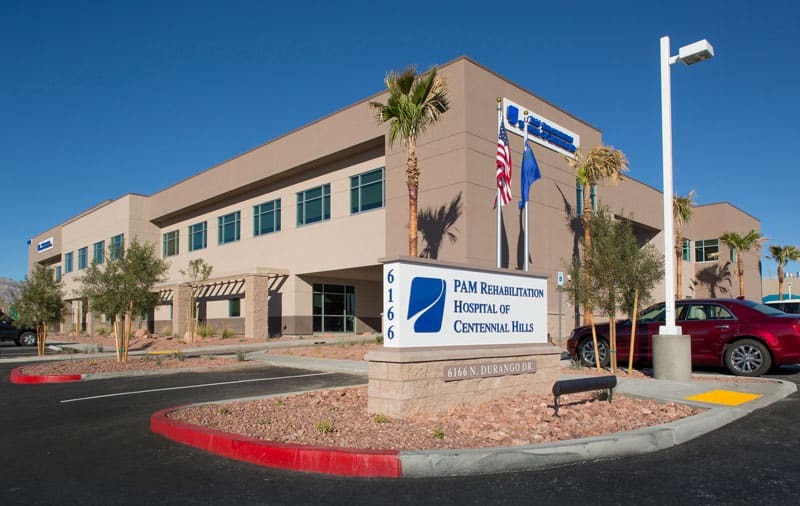 The PAM Rehabilitation Hospital of Centennial Hills opened its doors to patients in January 2018. Design features include 44 private rooms with accessible private showers, inpatient and outpatient therapy gyms, therapeutic outdoor walking and mobility gardens, in-house dialysis, specialized wound care, in-house pharmacy and specialty rooms with Tollus Lift Track to assist with patient mobility. Specialty rehabilitation programs include physical, occupational, speech and respiratory therapy, and language pathology. The HREI Insights Awards will be presented to the Winners at a public luncheon ceremony Thursday, Dec. 6, 2018, at the RealShare HRE Conference in Scottsdale, Ariz., one of the year’s largest gatherings of HRE professionals and healthcare executives. For more information on the awards, please see HREInsights.com. For more information on the RealShare HRE Conference, please visit RealShare.